Minimum Wage Machine | OhGizmo! The minimum wage machine allows anybody to work for minimum wage. Turning the crank will yield one penny every 5.04 seconds, for $7.15 an hour (NY state minimum wage). If the participant stops turning the crank, they stop receiving money. 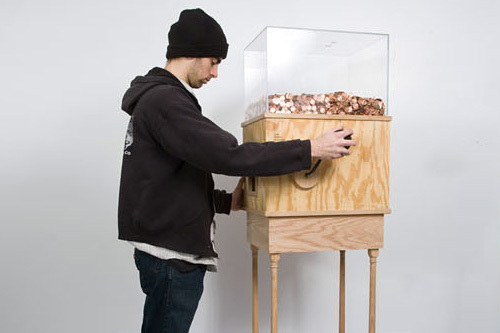 The machine’s mechanism and electronics are powered by the hand crank, and pennies are stored in a plexiglas box. All that’s missing is Raymond Scott’s Powerhouse playing in the background. See there needs to be a battery in there that stores the energy created by the cranking. That way those pennies being paid are worth something. If you own a business, you should get something like this that's hooked into the power in your store, so while they're cranking it (or doing something else that could generate more energy), it helps offset your energy costs. So everyone wins!